Canola crops across the Prairies look very good, in general, and growers are optimistic at this stage of the season. Top-dress fertilizer is a hot topic this week. The most efficient way to apply fertilizer on the Prairies is during the seeding pass, but some circumstances do call for top up nitrogen or sulphur for canola. 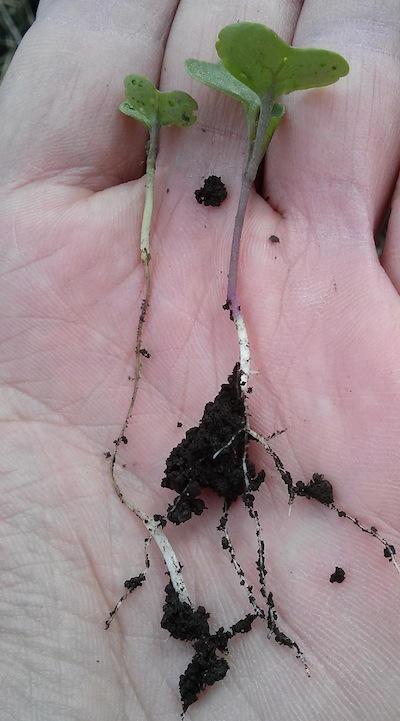 Seedling diseases such as rhizoctonia wirestem are showing up, perhaps due to deep seeding and tighter rotations, both of which increase the risk. Seedlings that die from disease can dry up and disappear quickly, so scouting early is the only way to determine the cause of these missing plants and patches. 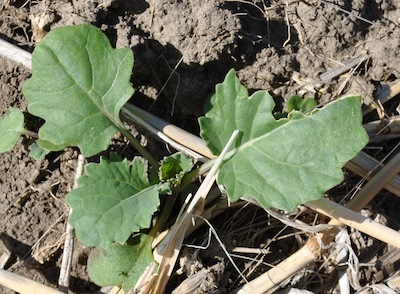 Glyphosate applications that are higher than label rates or applied after the 6-leaf stage can seriously set back Roundup Ready canola yield. Apply before the 6-leaf stage as outlined on the label, and consider an approved tank mix to get weeds that may not be controlled at the label rate. Flea beetle feeding seems to have picked up again, with many fields near thresholds. 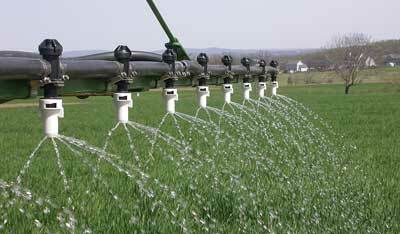 When does top-dress fertilizer make sense? Click here for more information on products, rates and timing for best results from a fertilizer top-dress. This article has just been updated. If you’re on the fence about a top-dress application, consider applying a rate high enough to make a difference — such as 30 pounds of nitrogen or 20 pound of sulphur — to part of a field. Mark the location and compare yields for treated and untreated areas. Increasing greening does not necessarily translate into increased yield, so a simple observation of crop colour is not enough to determine the value of the top dress. If you do see a yield difference, the best solution may be to increase fertilizer rates at seeding. Spraying late or at higher-than-label rates can reduce canola profits. AAFC research showed an advantage of 3 bu./ac. 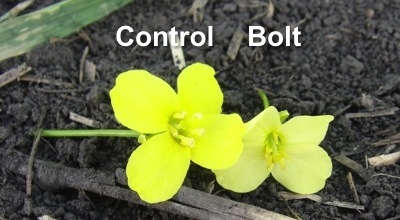 for controlling weeds at the 1-2 leaf stage of canola versus the 3-4 leaf stage, and a 7 bu./ac. advantage when applied early versus the 6-7 leaf stage. At $12 per bushel, that early control provides $36 to $84 per acre more profit with no added cost. These numbers will be even higher if a preseed burnoff was not completed. Late applications of glyphosate on Roundup Ready canola can add to those losses. Monsanto research demonstrated a 3 bu./ac. yield loss as a result of spraying glyphosate on their glyphosate tolerant (Roundup Ready) canola at higher than labeled rates and at first flower —beyond the 6 leaf stage on the label. The maximum rates of glyphosate that can be applied to glyphosate tolerant canola is two applications of 180 grams active (gae) per acre or a single application of 270 gae/acre. The application window is up to the 6-leaf stage. Applications made when cool cloudy days follow cool nights will result in lower herbicide efficacy than applications made in warm sunny days. Cloudy days don’t provide the photosynthetic activity required for many herbicides, including Group 10 glufosinate. And nights near freezing followed by days with highs that barely reach 10 C will not provide high metabolic activity required for best results from Group 9 glyphosate. Herbicides in general tend to work best in warm sunny conditions when weeds are actively growing and cycling nutrients into their growing points. In these conditions, weeds will take in herbicides most efficiently. Flea beetle spraying picked up again this week, as more canola fields reached thresholds. 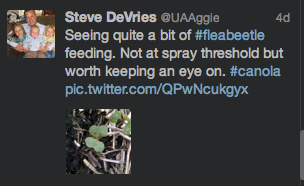 Don’t give up on flea beetle scouting just yet. 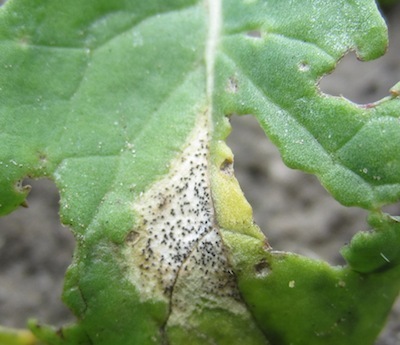 Click here for more on the flea beetle spray decision. Cutworm feeding has been detected in some fields, but spraying is still minimal at this time. Digging will be required to distinguish whether cutworms or wireworms are to blame — or not — for patches within a field. Cabbage seedpod weevil have been spotted in canola in southern Alberta. Wait until early flowering before taking action, if action is necessary. Early season hail rarely has an impact on canola yield potential. Hailed seedlings usually come back very well. If hail breaks off both cotyledons or snaps the stem, these plants usually do not survive. But even in these severe cases, while individual plants may die, a whole canola crop is fairly resilient to early season hail when it comes to overall yield potential. Upcoming events with CCC staff presentations.